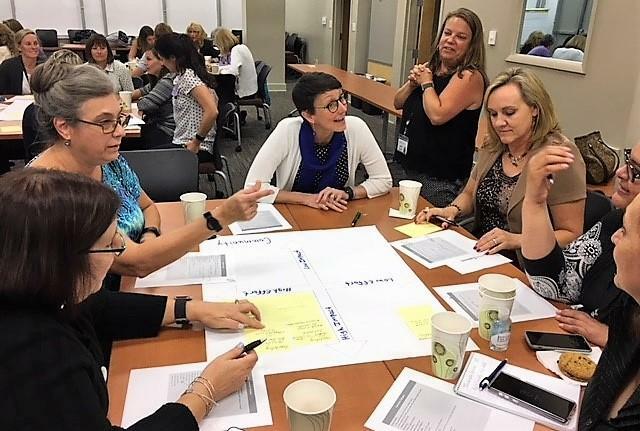 Ellis Vaughan DNP, RN, Clinical Services Coordinator, Director of Nursing Buncombe County Health and Human Service listens as Dr. Susan Mims, Chief of Pediatrics at Mission Children's Hospital brainstorms with members of the Immunization Coalition. Ellis Vaughan DNP, RN, Clinical Services Coordinator, Director of Nursing Buncombe County Health and Human Service addresses the Immunization Coalition. 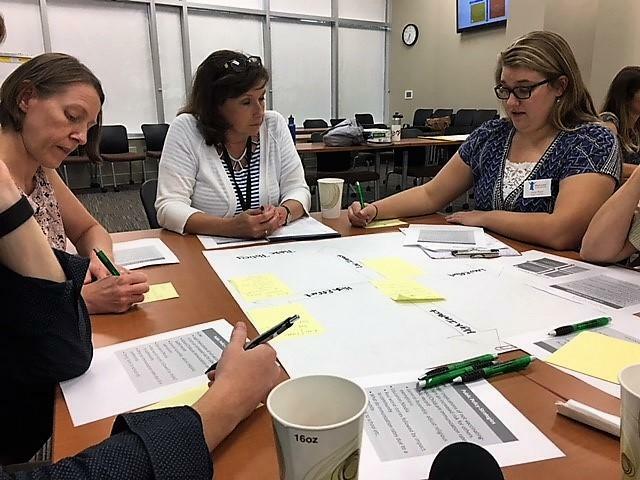 Buncombe County Health and Human Services Director Dr. Jennifer Mullendore takes notes during a brainstorming session. State health officials have extended the immunization deadline for public school students to November first - to give more time to families impacted by Hurricane Florence. Meantime, in Western North Carolina, health officials are facing a different kind of vaccination challenge – the growing number of parents who are choosing not to immunize their children. BPR’s Helen Chickering has been following the newly formed immunization coalition as it works to reverse that trend. She checked in with them in September, during one of their meetings. It’s a Tuesday night in downtown Asheville. Clustered around tables are health officials, school officials, doctors, nurses and parents. This is the group’s third meeting and the first since North Carolina released the latest vaccination rates. 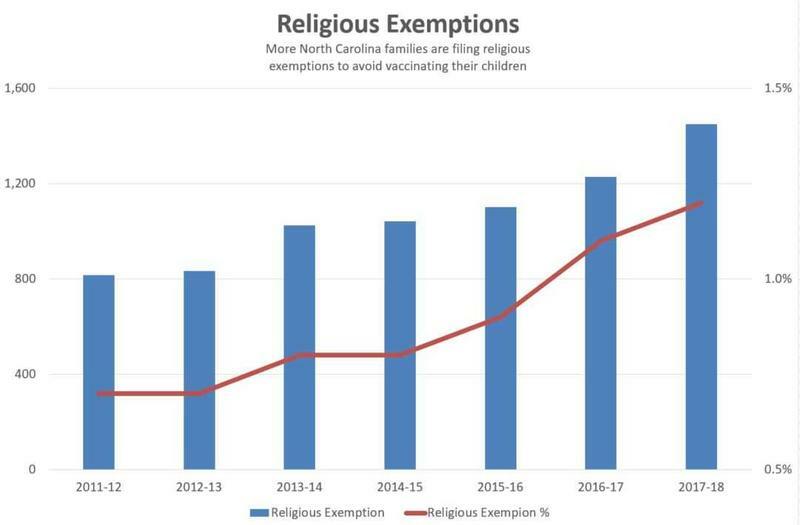 Buncombe County once again had the highest number of unimmunized kindergartners in the state with 5.7% taking a religious exemption during the 2017-18 school year. “It is unfortunate, that our rate did increase, but I think that just gives us more momentum.” says Ellis Vaughan, Director of Nursing for Buncombe County Health and Human Services, and one of the coalition organizers. 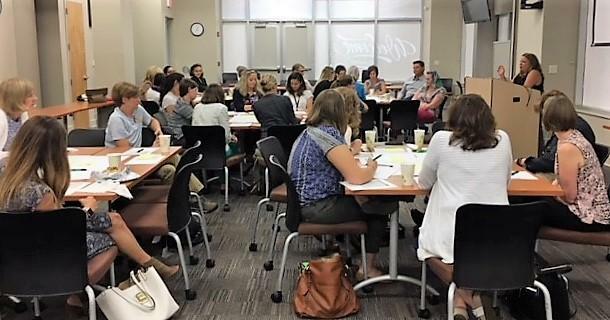 On this evening the group is brainstorming ideas to connect with vaccine hesitant parents. Along with the brainstormers, were the listeners including Sarah Hartnett, Director of Student Services at Evergreen Community Charter School in Asheville, where 20 percent of the 2017-18 kindergarten class claimed a religious exemption. “One of my roles is collecting students information for immunizations and exemptions and I feel like it’s a tricky balance for the encouraging families to do the right thing for the bigger community and being mindful of parents’ rights to choose. “ says Hartnett. A tricky balance for school administrators and an ongoing challenge for public health officials who are concerned about the risk of an outbreak. I’m Helen Chickering, BPR News. Under North Carolina law, no student may attend any classes in any school without a certificate of immunization. Children must be immunized against diphtheria, tetanus, whooping cough, poliomyelitis, red measles (rubeola) and rubella. However, the law allows for exemptions if a child has a medical exemption, which requires a certification from a licensed physician. It also allows for an exemption for "bona fide religious beliefs" of the child's parents or guardians. This exemption requires only a written statement of the religious beliefs. The latest numbers from the North Carolina Department of Health and Human Services show for the 2017-18 school year, Buncombe County once again had the highest number of unimmunized students, who opted for a religious exemption. On a busy Thursday morning at Asheville Children's Medical Center, Dr. Sam Kohn made the rounds. It was toward the end of summer break, so there were lots of back-to-school check-ups and vaccines on the schedule that day. Many visits were easy, following the simple routine of parents bringing their tots in for their shots. 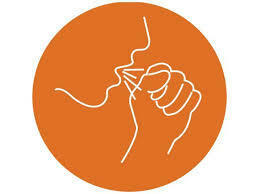 Health officials have confirmed four cases of pertussis, (whooping cough) in Buncombe County. Three other cases have been identified, which health officials say are connected to the four lab-confirmed cases. BPR's Helen Chickering spoke with Buncombe County Department of Health and Human Services medical director Dr. Jennifer Mullendore about pertussis, the cases and what health officials are doing to help stop the respiratory illness from spreading.